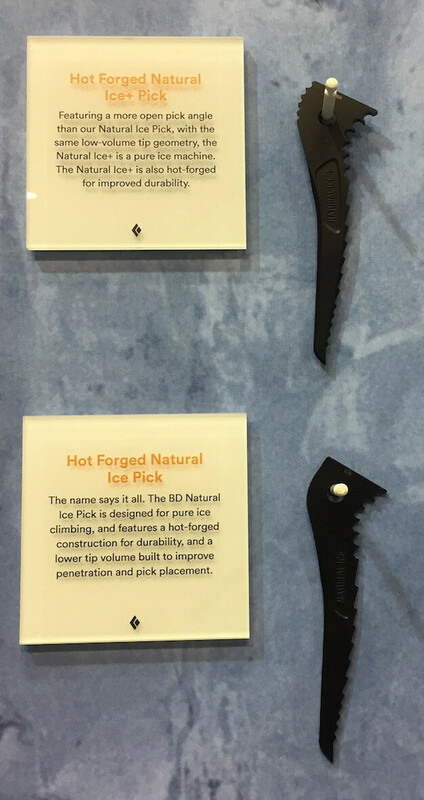 All Black Diamond’s picks will now be hot forged. The pick designs stay the same and they’ll be backward/forward compatible. They’ll also come with an epoxy coating that will help it hold it’s gloss and prevent scratching. Previously the Spinner and Slinger used steel wiregate carabiners, now, they will come with lighter aluminum locking carabiners. The tether webbing material has also been updated and will absorb less water, also helping to keep the weight down. The Momentum is now coming in a vegan version! Everything is the same (shape, characteristics) from the previous Momentum, except the footbeds and straps will now be synthetic instead of leather. It’ll come in the same high volume (men) and low volume (women) versions as the standard momentum. The Alpinist line of crampons has a new addition to the line with an offset mono-point, called the Alpinist Tech. In addition to the mono-point, it has a smaller horizontal secondary point for additional support. It’ll be the lightest technical ice crampon CAMP/Cassin makes. The front plate is very similar to the Blade Runner crampon, but it’s points are non-adjustable making it much lighter. It’ll come standard with antibotts in the box (they won’t come installed). CAMP / Cassin has had many requests to add a hammer/adze accessory to the X-Dream. Instead of re-designing the tool, they redesigned the pick, adding a new integration option. The new picks will accommodate a hammer/adze and will fit like a puzzle piece into both the Ice and Mixte picks. In the photo you can see that the orange piece is a “blank” which will come standard with the new picks. The hammer and adze accessory will fit into the pick in lieu of the orange piece. The Dark Machine is a hybrid carbon and aluminum ice tool. The handle is all carbon, while the shaft is aluminum wrapped in carbon. The aluminum reduces weight and the carbon adds damping. The Dark Machine has a higher balance point than the previous Grivel ice tools and is made for moderate to aggressive ice and mixed climbing. Nearly identical to the Dark Machine, the Dark Machine X incorporates a more aggressive handle design. The wider/more elongated handle allows for a greater resting position in overhanging conditions. Made for extremely overhanging mixed and ice terrain, and comps. Note: The handle will come wrapped in the future, pictured is a prototype to show off the carbon construction. 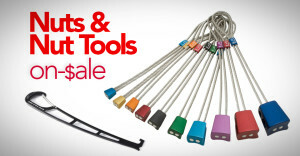 All of Grivel’s ice tool head accessories have been updated to be fully interchangeable. The new pick/accessory system will allow you to change from nothing (a blank), to hammers (normal or mini), or an adze while using the same pick, or vise versa. The picks will be backward/forwards compatible with all Grivel’s ice tools. The Duetto is a lightweight EPP (expanded polypropylene) foam helmet that is dual certified for climbing and skiing. It’s not the lightest on the market but it is the lightest dual certified helmet. The Duetto helmet is ~40% lighter than the other dual rated helmets out there. 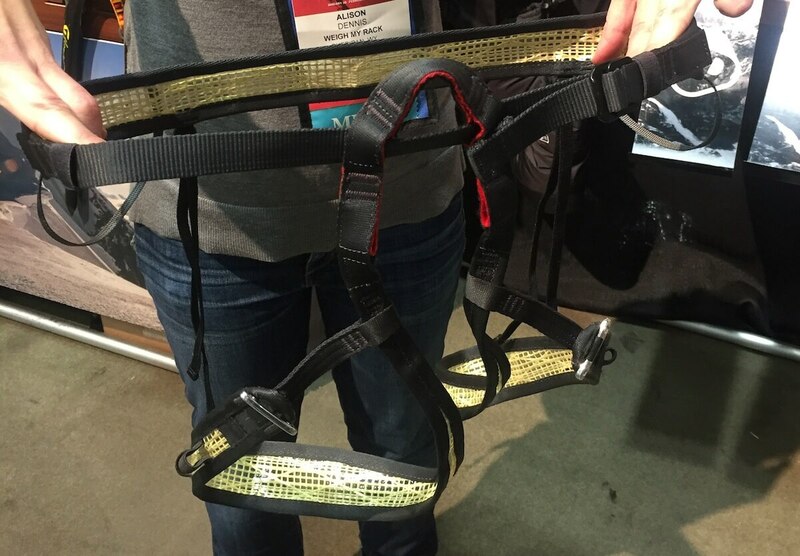 Made of aramid fabric (same material used to make high performance sails for sailboats), this harness can be completely undone for putting on or taking off with skis on. The fabric is stiffer than other lightweight materials, like mesh, which reduces bunching and slightly improves comfort. It’ll come in 3 sizes and the leg loops have two different closure points adding adjustability in fit. Additionally, the waist belt can be threaded in two areas to add more fit customization. The Grivel Scream is a belay plate made for rappelling with skinny rap lines. No belay device is rated for the tiniest diameters of rap lines, except the Scream! It’ll work for ropes 5mm – 8mm. This design targets the skimo market who only carries a rap line. 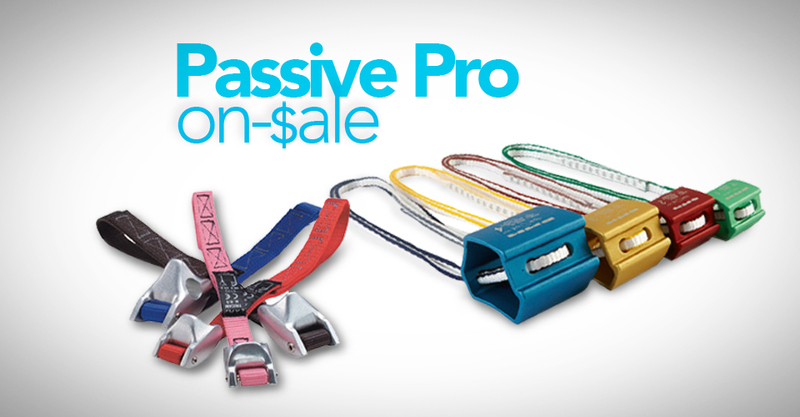 It’s not designed for climbers using a single rope + a rap line. The next closest small diameter belay device is Edelrid Micro Jul which is rated for 6.9 – 8.9 mm ropes. The Ghost pick now has a more comfortable shape for holding onto it with a flatter top surface and finger grooves on the bottom of the pick. The adze/hammer integration is updated, too. The Ghost is a great lightweight axe that has a classic spike, and the Ghost Evo is even lighter, primarily designed for skimo use. This is another skimo-designed product which eliminates the need for a carabiner when using a “third hand” prusik. It’s a prusik loop with a metal clip that will hold the prusik in place. One end is meant to girth hitch onto your harness and a metal stopper creates a faster method for securing the prusik to the rope. Note: The picture below shows the stopper as a 3D-printed plastic piece, it’ll be metal in the final version. The Oly Monz is the first mountaineering boot with toe tech fittings, a big deal. You can now skin in this boot (not recommended for downhill skiing). Additionally, this Everest / Antarctica / North Pole / Expedition boot is now warmer and lighter. Sorry about the not stuffed gaiter pic, it looks far less impressive floppy…we were totally focused on the tech fitting. 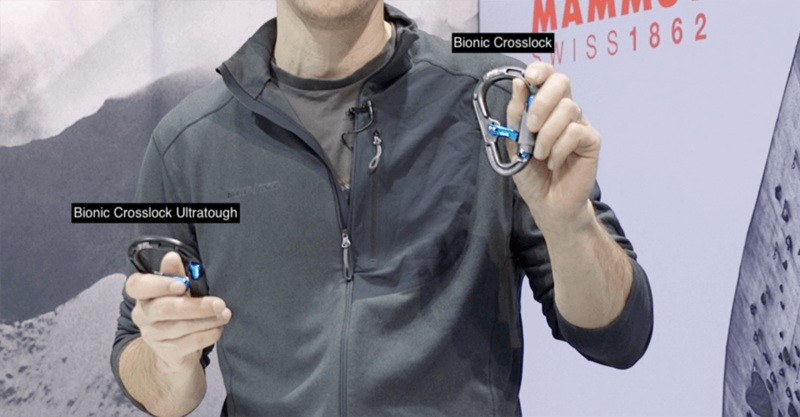 Mammut brings out a new offering on a locking carabiner with a belay keeper. The locking mechanism spring can move up or down, making it easier to open, but still stays secure while preventing cross-loading. The Ultratough version incorporates a ceramic coating that dramatically improves abrasion resistance (with less than a gram of added weight), making it ideal for people who burn through a lot of belay ‘biners. Mammut also showed us a $99 long brush stick with 2 brush heads (crimps and slopers) and a training board that can connect to a smartphone. We’ll expand in another post, coming soon. The new Dart will replace the previous Dart and Dartwin crampons. It has modular front points that can be configured as a long or short mono-point, dual-point, or asymmetrical dual-points. It’ll become an all-around crampon that can transform from ice climbing to mixed and dry tooling. It’ll also have extra lateral secondary points to add stability on ice bulges or snow crossings. Naturally, the front points will be replaceable and sold separately. The Kit Cord-Tech is an aluminum crampon heel and cord linking bar to transform the Irvis or Dart to a super lightweight rig. In addition to the lightweight nature, the cord linking bar will make packing even more compact. The corded “linking bar” will be the same as the Leopard LLF crampons. The Multihook is a V-threading hook tool that can also clean ice out of ice screw tubes. The base of the hook has a serrated blade to cut ropes and cords. Conveniently, it can also can fit inside an ice screw for easy transport. The Octo pouch is designed to securely store and transport ice screws. There are 8 compartments that hold screws, and you can transport an additional 4 screws — they’d sit between each double compartment. The black tabs you see in the middle of the screw holder act as locks and will prevent the screw from falling out no matter how you hold / shake the pouch (exception: the 10cm screw). There is a mesh pocket in the middle for additional accessories like frontpoint replacements or files. The Ultralight pouch is primarily designed for carrying crampons, but it could also transport ice screws — or anything else for that matter. 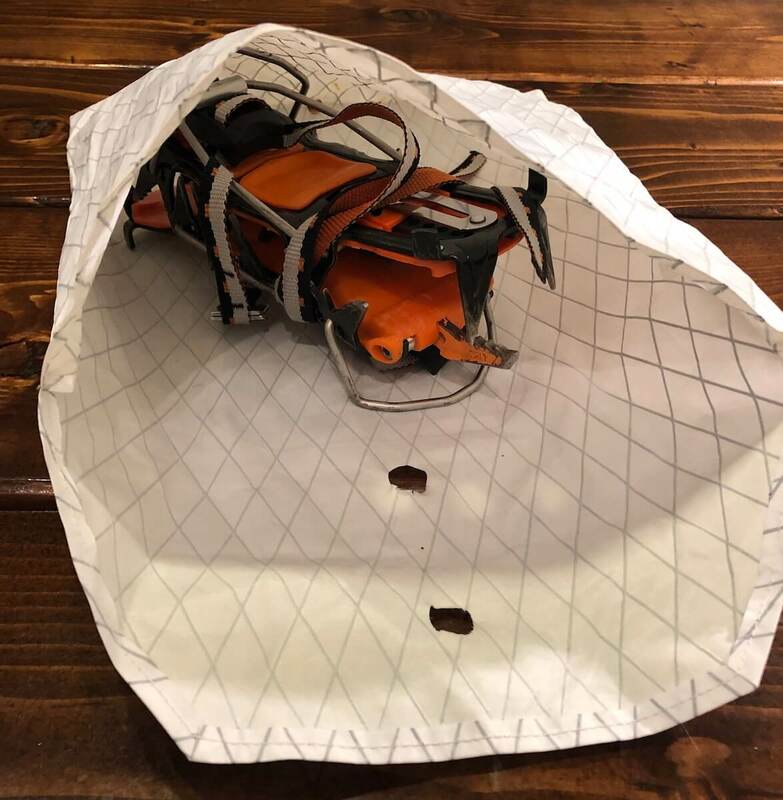 The design is inspired by Conrad Anker, who has used US Postal Service mailers as his preferred pointy-object transport method. The Ultralight pouch material is light and tough, made from the same materials as racing sails. It also has a waterproof film coating and drain holes. Normally climbing shoes aren’t touted as “lightweight” but this will be the lightest shoe out there. It is insanely flexible, made of minimal materials, and can basically fold up to fit in your pocket. The upper is mesh and there is no midsole. It’s also vegan. A low volume version of the popular Tenaya Ra shoe. It’s an all-arounder that’s actually good at being an all-arounder. It’s great for longer days and can still edge and smear when you need it. A cut-out hole in the sole adds a bit of flex and sensitivity. Tenaya’s widest shoe, this will also the most aggressive. It’ll also be one of the most sensitive in their line with a split sole design (no rubber between the toe box and the heel). It’s ready for the steeps, and with rubber on the toe, you can toe hook too. A tough sport draw ready for projecting. With wider gate openings (yet same strength ratings) compared to its predecessor, the React series. 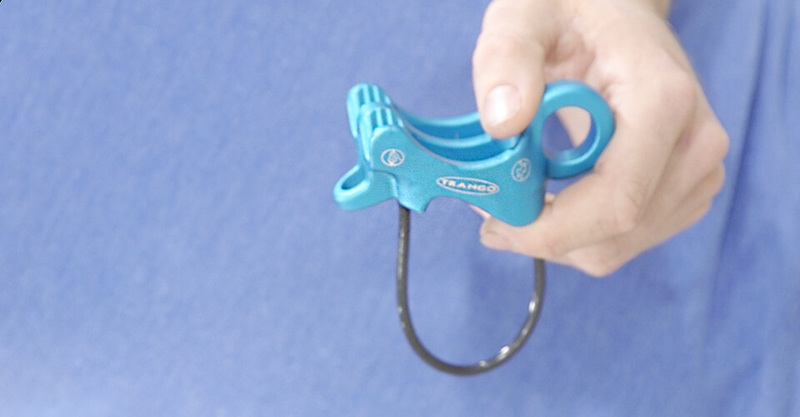 Trango’s first guide-style belay device with design cues from Trango’s B-52 belay device. 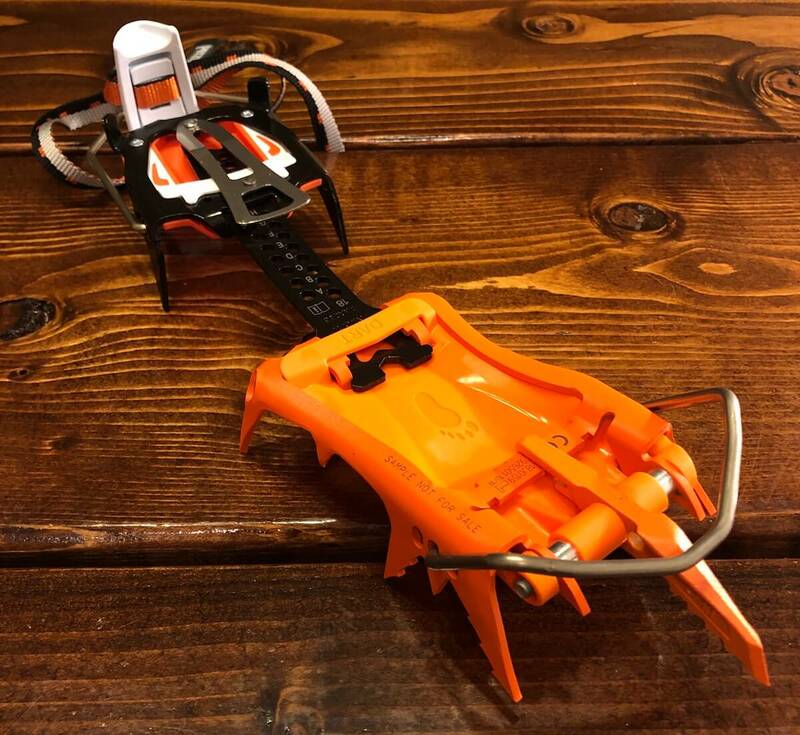 This will replace Trango’s Shark nut tool and was designed to be stripped down while still including the most key features: a palm protector and wire gate. Technically it’s not new, but it’s very rarely on the market. These babies cost a ton to make (a lot of aluminum) and are super niche, so they aren’t produced often. Pre-order/buy on Trango’s website! That’s it for now! Expect much much much more gear at the next show review! And, if you have questions about any of this gear, let us know in the comments, and we’ll work to get you answers! 50 bucks for a karabiner !?!?!? Mammut really are taking the piss now. I’ll stick with my steel oval thanks.